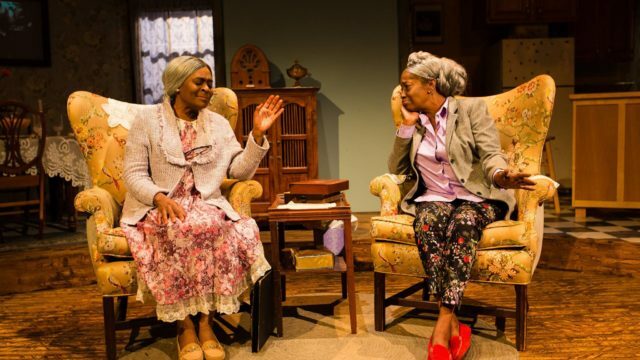 Milena (Sellers) Phillips (left) and Sylvia M’Lafi Thompson in “Having Our Say” at New Village Arts Theatre. They were honey and vinegar. Sugar and spice. Sadie Delany was the sweet one, who’d cajole her way into getting what she wanted. Bessie was the sassy, outspoken, stubborn one. Emily Mann’s 1995 play “Having Our Say: The Delany Sisters’ First 100 Years,” was based on the best-selling book of the same name, which was written by the sisters (with Amy Hill Hearth). The book and play are an account of the tumultuous century they lived through. When we meet them, in their cozy, shared Mt. Vernon, NY, home, Sadie is 103 and Bessie is 101. (Bessie was 104 when she died in 1995; Sadie lived to 109, and passed in 1999). Their father, a former slave (who was lucky to have been taught to read and write), became the first black elected Bishop of the American Episcopal Church. Their mother was a teacher and administrator at St. Augustine’s School (now University) in Raleigh, NC, where they were raised, and where their father was the vice principal. All 10 Delany children learned to play an instrument, and went on to higher education and formidable careers. Bessie became a dentist (graduating from Columbia University in 1923, the only black female in her class). Sadie was a high school teacher with a master’s degree. Bessie was also an activist, who participated in many protests and marches. And there was plenty to protest. They were born after Emancipation, but they lived through the Depression, the Jim Crow and Civil Rights eras, and they often feared for their lives. Through it all, they were proud that the 68 acres their grandfather had acquired remained in the family — for 85 years. Sitting in comfy chairs, looking directly at us and treating us like guests (even inviting us to stay for the dinner we’ve watched them prepare and cook), they tell their story. There isn’t much drama in their relationship, but there was more than enough drama in their lives. At New Village Arts Theatre, director Melissa Coleman-Reed has chosen a pitch-perfect cast. They may be a bit spry for their ages, but Milena (Sellers) Phillips is thoroughly believable as the calmer, shyer Sadie, and Sylvia M’Lafi Thompson has all the feisty obstinacy the role of Bessie demands. The two centenarians participate in a constant give-and-take, peppered with mild-mannered teasing and bickering that, along with their mutual physical assistance, are credible and charming. With a twinkle in their eyes, they attribute their longevity to never having married (“we’re maiden ladies, not old maids,” they claim). 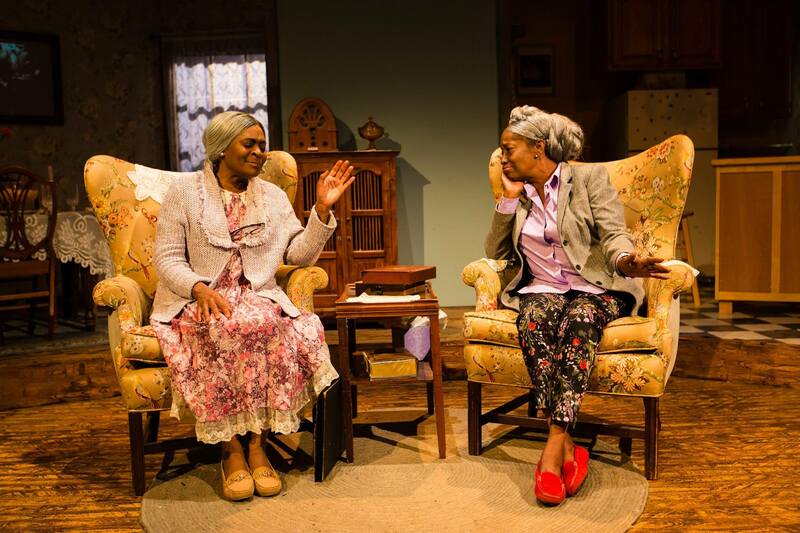 This may be the most elaborate and detailed interior set ever at New Village Arts (thanks to scenic designer Christopher Scott Murillo), from the lace curtains and antimacassars to the fully working kitchen. The light pouring through the windows (designed by AJ Paulin) is also very effective. The costumes (Coleman-Reed) seem just right, though Phillips’ wig is more believable than Thompson’s. We come away feeling like we really have visited with these two smart, sharp survivors, who witnessed so much history and made their own contribution to it. Their delightful aphorisms, which were published in 1994 as “The Delany Sisters’ Book of Everyday Wisdom,” are well worth noting (there are many in the play). Their father’s advice, which they took very seriously, plays out in this congenial theatrical work. “Papa told us our goal is to help people.” They did, and they continue to: their recollections help us try to understand what it might have been like to walk in their durable, enduring shoes. Performances are Friday-Saturday at 8 p.m., Saturday at 3 p.m., Sunday at 2 p.m.